A new tweak created by Nikos Lykousas is one that provides users with different options that many users have asked for. It is in the area of image selection areas of Safari and the Mail apps. If you tap and hold an image, this tweak will give the user an additional set of options in the user interface action sheet. I’m sure that you are wondering what options this new tweak gives to users. This new tweak offers users the ability to find the original source of an image, find duplicates of images or similar images that are out on the Internet, see the EXIF/XMP metadata of the image, do a Google search by an image, do a reverse image search using TinEye, use Jeffrey’s Exif viewer if the image has EXIF/XMP data, image operation meta tool. For all of these options, the users always have the option of either enabling or disabling the newly created settings entry on the device. 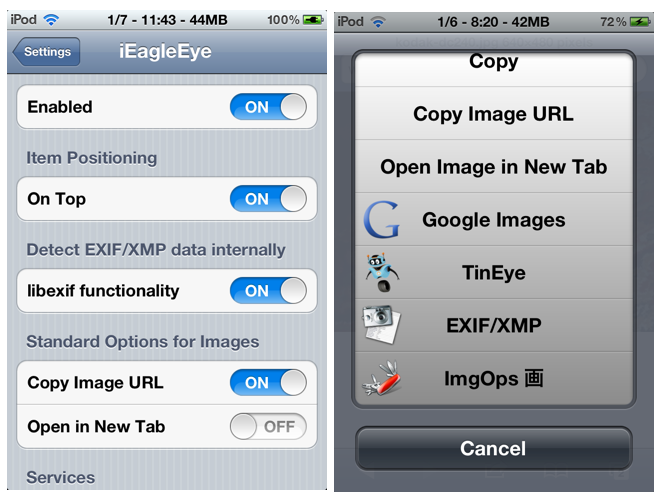 iEagleEye also gives users the ability to copy the image URL and open the image in a new tab if the user wants to. The tweak costs $.99 and is available for download from the BigBoss repository in the Cydia store. If you are an iOS user who has to deal with media related attachments or downloads quite a bit, then this tweak is just for you. This tweak solves an area which a lot of users have had issues with. The issues have occurred in the native Mail and Safari applications when users have tried to save images from the web or from an email that they have received. Generally, this only gives users the option to save the image to the Camera Roll. For many users this is just fine. However, those that want to get a little fancier were unable to do this until this new iEagleEye tweak came to the forefront. 0 Respones to "The iEagleEye App"